WhiteCloud Software Ltd. announced the release of version 4.7 of EAComposer. An innovative and easy-to-use enterprise architecture tool. Use it to manage your IT landscape and technology portfolio. Delivered as a pure SaaS product: cloud hosted with a subscription based license model. 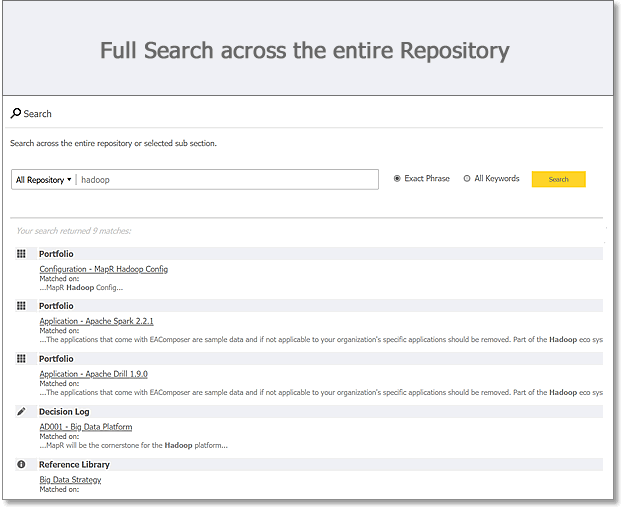 This released delivered a fast & easy search capability that goes across the entire repository. It covers the portfolio, reports, diagrams, projects, decision log, compliance assessements, reference & standards library and all the documents within the repository. - Search for Exact Phrase or using All Keywords: Option to either apply your search criteria as an exact phrase match or using all keywords.